For the third year in a row children from 5–16 and their families will be able to enjoy a free day of fun. And learn about science, technology, maths and engineering at the same time. 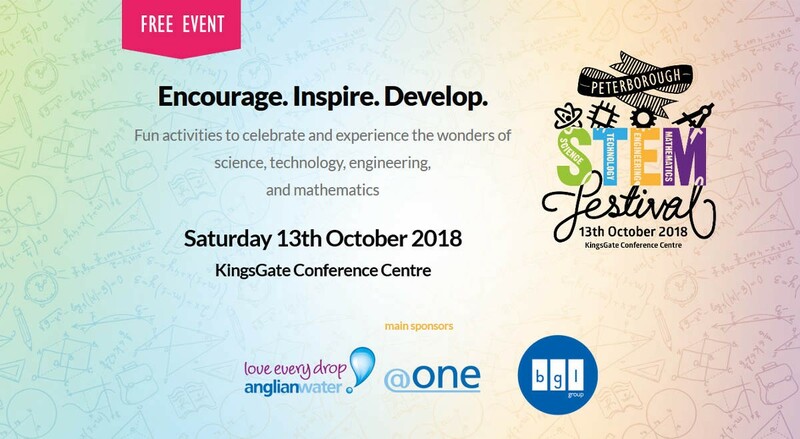 Peterborough STEM Festival 2018 is the biggest event yet, with more than 3,000 people expected to attend the KingsGate Conference Centre on Saturday 13th October. There are loads of reasons to attend. The speakers include TV presenter Maddie Moate and Horrible Science author Nick Arnold with interactive shows. Along with mathematician Katie Steckles, futuristic fashion from KonichiwaKitty, and Tom Rocks Maths. And there are loads more exhibitors with things for everyone to enjoy. Main sponsors Anglian Water and BGL Group have interactive engineering and tech-based escape rooms. There’s a Sahara Force India F1 car and simulator provided by Codem, forensic science with University Centre Peterborough, a Mad Science show in collaboration with Anglian Water, the RS Components Titan II truck full of the latest technology, and more. There’s retro gaming, 3D fantasy worlds, building the best paper plane, an introduction to coding, making your own musical glove instrument, hands-on science experiments cartography and map-making, building bridges and learning about amphibians and reptiles with a VR experience. And probably other activities that aren’t listed above. Peterborough STEM Festival is involved with Ada Lovelace Day. Which is a global celebration of the achievements of women in science, technology, engineering and maths. It’s founded and organised by the team at Digital People in Peterborough, a non-profit group originally set up to run a monthly tech meetup in the city. And it’s supported by some great sponsors, including Anglia Water and BGL Group. Not to mention a tremendous bunch of volunteers who give up days, weeks and months of their time to enable the Peterborough STEM Festival to happen. There’s also a growing calendar of related fringe events, including a Schools Challenge Day, First LEGO League and STEM Roadshow. To find out more about attending, sponsoring, exhibiting or volunteering now or for future events, check out the Peterborough STEM Festival website. And to find out about attending, sponsoring, presenting or volunteering with Digital People in Peterborough, then go to the DPiP website. Originally published at Disposable Media.